The World Karate Federation (WKF) has updated its rating, where Azerbaijan’s ‘Black Brilliant' Rafael Aghayev was ranked the second. 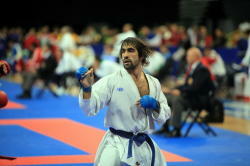 Aghayev took the second place in the category up to 75 kg, azerisport.com reported. The first place belongs to American karate fighter, Thomas Scott. In the women's standings, Azerbaijan’s Irina Zaretskaya (68 kg) took the second position, losing first place to Alice Buchinger from Austria. Rafael Aghayev has managed to achieve all of the highest sporting victories in karate; he is multiple European Champion and repeated World Champion. Moreover, this year Azerbaijan’s ‘black brilliant’ won a gold medal in karate (kumite) competitions at the 4th Islamic Solidarity Games in Baku. 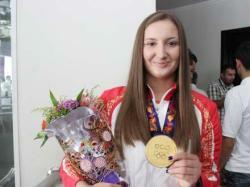 Azerbaijani athlete Irina Zaretskaya is known to us for numerous victories at the international area. She is the owner of the gold medal at the Premier League Karate1 2014 in Almere, bronze at "World Karate Cup 2014", gold at the Premier League Karate1 2015 in Istanbul, silver at the Premier League Karate1 2017, etc.